Heirs to a fallen realm that defied the very heavens, the people of the Old Empires were summoned to Faerûn millennia ago and enslaved by wizards. With the help of their foreign deities, the former slaves freed themselves and settled that lands that are now Chessenta, Mulhorand, and Unther. These countries rose to power thousands of years ago and have been in decline ever since, their vast territories since lost to younger and more vigorous realms. Resistant to change and hostile to visitors for centuries, the Old Empires have been forced into active participation in Faerûn in recent years, and may be regaining a prominent position in Faerûnian politics and culture. Imports: Cheese, glass, horses, magic weapons, mercenaries, perfume, pork, slaves. A group of cities considered a single nation by the rest of Faerûn, Chessenta is anything but united. The cities war against each other over old slights, philosophical differences, or economic leverage. Adventurers and mercenary companies make a good living here, hired by various governments for sneak attacks, strategic planning, or protection. The culture of Chessenta is obsessed with physical conflict, with war heroes considered very highly. The nation is friendly to dwarves and half-orcs, but uneasy with elves. The Chessentans appreciate the arts and are great fans of theater; the bardic profession is second only to that of fighters. The people of Chessenta are passionate, living each day to the fullest. Seen by outsiders as a drunken and riotous people, the Chessentans feast and fight often, not doing anything halfway. Their athletic competitions are popular events, particularly wrestling, and almost every citizen has some skill at fighting. Most of the rulers of Chessenta are retired soldiers, and the title of War Hero is one of the greatest honors a person can receive, with any particular battle rarely finding more than one person worthy of such a title. This dedication to war suits the Chessentans well, for their nation has prospered through the conflicts between their rival cities. Chessentans practice slavery, although it is less widespread than in Unther and Mulhorand. Unlike in those countries, a slave-owner can grant a slave freedom at any time, often for exceptional work. Slaves are kept illiterate, except those in Cimbar. Chessenta's sizable middle class controls the country's money. The government encourages prosperity for all, so tax revenues remain high. Chessenta occupies a broad, fertile plain ringing the great Bay of Chessenta in the southeast of the Sea of Fallen Stars. Broken mountain ranges and rugged highlands mark its eastern, southern, and western frontiers. Adder Swamp: Deadly snakes, wererats, and werecrocodiles in habit this dangerous swamp. The werecrocodiles have a half-sunken city on the bay, and the two kinds of lycanthropes war constantly. Akanapeaks: Containing the highest peaks in Chessenta, this range is best known for the ferocious Flaming Spike orc tribe, which numbers in the tens of thousands and inhabits a large abandoned dwarven mine. The Chessentans mine iron here in the safer areas. Riders to the Sky: This mountain range is actually mostly hills. Inhabited by bandits on the east side, trolls and duergar on the west side, and pteranodons throughout, the hills sport ruins from an aarakocra civilization hunted to extinction by mercenaries. Threskel: South of the dormant volcano known as Mount Thulbane and north of the Riders to the Sky lies the sparsely settled land of Threskel, claimed by both Chessenta and Unther but really part of neither. A very old vampire green dragon named Jaxanaedegor lairs somewhere in Mount Thulbane and claims the wastes of Threskel as its kingdom, although it cannot abide the touch of daylight. 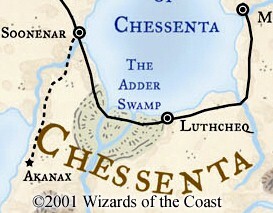 Chessenta is carved up between three major factions or alliances: Akanax, Cimbar, and Soorenar. Most of the other cities owe allegiance to one of these three, although some stand neutral. Airspur (Large City, 22,282): This powerful trading port has a 30% half-orc population. For several years it took an aggressive stance against Cimbar, and the city is now rebuilding its strength and looking out for other enemies. It is ruled by a military council led by Khrulis (N male half-orc Ftr8), a crafty, pragmatic, and greedy man. Akanax (Large City, 24,632): This town functions like a military camp. Male citizens are conscripted into the army or slain for desertion. Strangers are only barely tolerated here and viewed with suspicion. No mercenary companies are allowed within its borders. Akanax has been warring with Luthcheq for several years, and has allied with Cimbar against Soorenar. King Hippartes (LN male human Ftrl9) is a tyrant but considered the finest soldier in the nation. Akanax's city population figure doesn't include the army camped outside the city, some fifty thousand soldiers. Cimbar (Metropolis, 110,843): Hundreds of years ago, Tchazzar chose Cimbar as the center of his short-lived Chessentan Empire. Cimbar is the traditional capital of Chessenta, although it has only been so in truth for one short period of history. The city requires participation in the arts, philosophy, and music by the population, and it is known for its college of sages, and artist's college. Cimbar boasts the second largest fleet in the eastern inner sea (behind Thay). Its fleet frequently battles with cities on the north coast. Cimbar's college of wizardry is in the process of being rebuilt after its destruction in 1370 DR during a rite of power involving an evil Shadow Weave artifact. Not long ago the ruling Sceptanar was unseated by the shadow mage Aeron Morieth (N male half-elf Wiz13/Sha3), who held the job for a few months before appointing the noble-born wizard Melisanda of Arrabar (LG female human Wiz7) to replace him. Aeron now resides in the Maerchwood, a small forest between the Smoking Mountains and the Adder Peaks along the Winding River. Luthcheq (Metropolis 61,580): Also known as the City of Madness, Luthcheq is led by the Karanok family, all of whom belong to the cult of Entropy (a nonsentient giant sphere of annihilation that they think is a deity), a group that wishes to destroy all magic. The Karanoks - and particularly the current head, Maelos (LE male human Apr18) - hope Chessenta's fragile alliances destroy each other so they can take control. No mercenary companies are allowed here. Luthcheq dislikes users of arcane magic; known wizards and sorcerers face execution by burning. Elves (considered to be magical creatures) and dwarves (considered to be earth-wizards) are similarly prosecuted, as are those who associate with the taboo folk. Soorepar (Metropolis, 73,896): This aggressive port city is allied with Airspur and Luthcheq against Cimbar. The government consists of a representative from each of the three most powerful families in the city. They prefer to purchase victory with money and treasure, usually involving buying the services of powerful wizards (which sometimes puts them at odds with Luthcheq). The Chessentan people spent restive centuries under the rule of Unther during the zenith of that empire. The Chessentans grew uneasy with the decadence and religious oppression of their masters, and finally rebelled under a war hero named Tchazzar. Actually a red dragon secretly polymorphed into human form, Tchazzar managed to subdue Unther itself for nearly a century. Although the city-states of Chessenta swore fealty to a central monarch, each had a different idea of who that monarch should be, and Chessenta has since been rocked with wars between its city-states to determine supremacy. This near constant state of war has produced a nation of trained fighters and a reliance on external mercenary and adventuring groups to do dirty jobs. Chessenta engages in trade by sea with other nations and shows no signs of unifying again any time soon. Adventures in Chessenta generally involve aiding one city in its struggle against another. Burning Mountain: One of the Smoking Mountains (the range that separates northern Unther from southern Chessenta) recently erupted explosively, raining down hot ash for nearly a hundred miles in every direction. The explosion displaced monsters from the rest of the range, most of which have gone north. Included in this horde are young dragons, kir-lanans, reclusive wizards, and decaying liches. Rulers of the southern cities seek to hire mercenaries and adventurers to deal with the problem before the creatures reach civilized areas. One of the few ancient empires that has survived to the present day, for millennia Mulhorand existed under the rulership of physical manifestations of its deities. Now in the hands of. those deities' mortal descendants, Mulhorand has begun to change and accommodate the rest of the world, opening itself to foreign trade and ideas. With the collapse of Unther's government, Mulhorand has conquered much of its old rival's territory and may be looking to remake itself into the empire it used to be. Still unpopular in some western countries for its acceptance of slavery, Mulhorand remains an exotic land with powerful magic, old technology, and a powerful clergy. Mulhorand has long been a patriarchal nation, with the first son of a family inheriting two-thirds of the family's property, the second son getting the remainder, and all other children left to fend for themselves. With the removal of the deific manifestations and influence on Pharaoh Horustep III by foreign mercenaries, Mulhorand's laws have started to enforce equality between the sexes. Clerics are still the most respected members of society, with the vast majority of them being descendants of the incarnations of the deities they serve. Wizards and sorcerers, also well respected here, spend their time researching new magic or examining old artifacts. Religion is important to the Mulhorandi. They say prayers four times a day, clerics run the government, and the temples own all the nation's slaves (which are rented out to others). Class is also important: Bureaucrats (people of status) shave their heads and paint circles upon their foreheads. One circle indicates a freeman, two a wizard, and three a cleric. The middle class consists of artisans, craftsfolk, traders, mercenaries, and scribes. Below the middle class are the slaves, who are treated well; harming a slave is considered vandalism of temple property. It is possible for a slave to rise to the status of a bureaucrat if given sufficient education. For the most part, adventurers are seen as little more than grave robbers. Nonhumans are uncommon aside from the dwarves and gnomes in the Sword Mountains and elves and half-elves in the Methwood. The greatest source of dissent among the citizens is the rivalry between the churches of Anhur and Horus-Re. Anhur favors change and conflict while Horus-Re represents eternity and perpetual order. Now that Mulhorand is ruled by someone fully mortal once again, the dominance of Horus-Re is lessening, and deities from the Faerûnian pantheon are making inroads in Mulhorand while the local deities are expanding outward from their native land. Mulhorand is also unusual for its technology, primarily pumps to move water to irrigate crops. This aspect of the culture had fallen into decline for centuries but is now being revived by the clerics of Thoth and Gond. 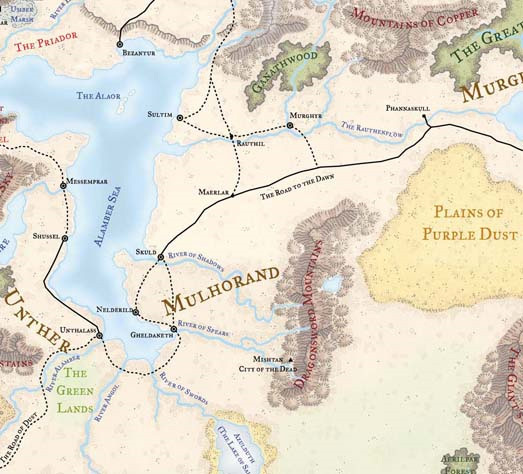 Mulhorand is a vast realm, stretching from the salty lake of Azulduth through its client states of Semphar and Murghom all the way to the Hordelands. Alamber Sea: This sea is heavily populated by the sahuagin that hail from their undersea kingdom of Aleaxtis, thought to be in the top third of the bay. The large island is the Ship of the Gods, an active volcano and a haven for pirates. Dragonsword Mountains: The Mulhorandi consider these high mountains impassable due to the large number of dangerous sphinxes, griffons, and yrthaks that lair here. Gestaniius the blue wyrm is the most dangerous of the mountains' denizens. Plains of Purple Dust: This region of faintly magical sand is inhabited primarily by purple worms, with human nomads living on the plains' western border. Under the dust lie connections to the Underdark; the cities beneath are controlled by cruel lizardfolk. Most believe that the battles between the deities of Unther and Mulhorand indirectly caused this wasteland. Raurin, the Dust Desert: This land was once the center of the Imaskar Empire; The Imaskari's battles against the Mulhorandi and Untheric deities destroyed their homeland, and the survivors moved west. Now Raurin is a wasteland of stone, sand, and dust inhabited by brown dragons, blue dragons, and a handful of rogue efreet. The desert also holds many ruins with powerful artifacts, as well as a large temple to the deity Set. The population figures below include roughly 20,000 of the Mulhorandi soldiers currently stationed in Unther. Glieldaneth (Metropolis, 172,243): The second largest city in the nation is a sprawling port ruled by clerics of Thoth. Its most prominent buildings are the Great University and the Wizard College. The majority of the arcane magic items created in Mulhorand are made here. Mishtan (Small City, 6,459): The temple of Osiris, Mulhorandi power of the dead, rules this town. Mishtan's claim to importance is its proximity to the Land of the Dead, the ancient burial ground for pharaohs and their families. This complex of tombs in the Dragonsword Mountains is constantly under construction, and the number of people working here increases by a factor of ten in the springtime. Animated skeletons and zombies within the tombs destroy grave robbers and defilers. Neldorild (Metropolis, 86,121): Neldorild is a city of affluent nobles and wealthy retirees seeking escape from politics. The city is less than twenty years old, and parts of it are still being constructed to accommodate new arrivals. Ruled by the church of Nephthys, the city is intolerant of thieves, and stealing is punishable by death. Skuld (Metropolis, 204,539): The oldest continually inhabited city in Faerûn, Skuld was founded over thirty-five hundred years ago. Its inhabitants boast (truthfully) that no invading army has ever breached its walls. The part of Skuld called the City of the Gods is the site for temples and the former residences of the incarnated Mulhorand deities, and its grandeur is all the more spectacular compared to the squalor of the rest of the city. The many laws here are strict, and taxes are both numerous and high, although those affecting nonhuman visitors have been largely dropped. Four thousand years ago, the Imaskar Empire suffered a great plague that decimated its population: The wizard-rulers of Imaskar opened a pair of great portals to another world, pulling forth over one hundred thousand humans, then closed the portals and sealed all connections to that world forever. The Imaskari enslaved and oppressed these people (the Mulan), and the slaves offered countless prayers to their deities that went unheard because of the Imaskaran barrier. Through the intervention of Ao, the slaves' deities were able to send powerful but mortal versions of themselves through alternate methods, bypassing the barrier. The deities battled and defeated the Imaskari, settling the lands to the west along with their followers. The nation of Mulhorand and Unther were born from these events, and after years of war, the divine manifestations agreed to abide by their common border and pursue conquest of other lands. Nine hundred years later, another great portal opened to an unknown world, calling forth unnumbered hordes of orcs. The humanoids attacked the northern reaches of Mulhorand and Unther, drawing the divine manifestations into battle with the barbarous enemy. In response, the orc clerics summoned manifestations of their deities, resulting in many deaths on both sides. Eventually the orcs were defeated and fled to elsewhere in Toril. Over the next two thousand years, Mulhorand's daughter states broke free, forming the nations of Murghom, Semphar, and Thay. Mulhorand existed in a state of slow decline for hundreds of years until the end of the Time of Troubles, when Ao removed the Imaskari barrier. This allowed the Mulhorandi manifestations to reunite with their primary essences. Ruled by a true mortal for the first time in its history, Mulhorand went through a brief period of repression and martial law, then stabilized somewhat as the clergy, long used to ruling the country, reestablished a state of normalcy. With the death of Gilgeam the Tyrant, Unther lost its lone manifest deity. Anhur, the Mulhorandi god of war, had long been pressing the pharaoh to take a more active role in the world, and the change in Unther was the catalyst that the young pharaoh Horustep III (LG male human Clr4/Pal6 of Horus-Re) needed. Realizing the border treaty between the deities was no longer valid without the presence of the manifestation of Gilgeam in Unther, the pharaoh allowed the clerics of Anhur to lead an army into Unther. Greatly aided by the Gold Swords, a skilled foreign mercenary company led by Kendera Steeldice (LG female human Pal11 of the Red Knight), the army of Mulhorand marched around the Alamber Sea as far north as the city of Shussel, conquering most of Unther in the process. Mulhorand's military energy is currently being used to end or divert slave revolts and train former Untheric slaves in the service of the temples of Mulhorand. Back in Skuld, the pharaoh had become quite enamored of the mercenary Kendera, whose dedication, skill, and experience impressed him greatly. With the able-bodied men of the country camped to the west, Mulhorand faced a severe shortage of workers in all disciplines. Under Kendera's advice, Horustep III has passed a law allowing women to work in the same jobs as men and is considering plans to restructure the inheritance laws to be more equitable among all siblings. Now Mulhorand has expanded its territory by nearly half, with the remainder of Unther barely able to organize a coherent defense. Thay, Chessenta, and other nearby nations have taken care to treat Mulhorand carefully, and diplomats from many nations visit Skuld, hoping to stay in good favor with the pharaoh. The remainder of Unther trembles at the thought of next year's campaign, but the pharaoh's military advisors caution him not to expand too quickly. Mulhorand's power rests on three pillars: the pharaoh and his army, the clerics and the vast possessions of their temples, and the land's wizards. The pharaoh's ascendance does not please the clerics of deities other than Anhur and Horus-Re, nor does it please the mages. Intrigues and schemes to control the young and aggressive pharaoh are becoming common in the city of Skuld. Thieves in the Night: The church of Mask has taken advantage of the absence of the military in Mulhorand to conduct some notorious heists in Skuld. The official churches of the state have been unable to track those responsible, in part because some of the thieves have been able to melt away into thin air. Unknown to the Mulhorandi, the secret ritual discovered by the Shadowmasters of Telflamm (see Telflamm, under Thesk, below) has been taught to local Maskarran clerics, and unless they are caught soon, every thief in the city will gain this ability. Once, a great empire like its sister nation Mulhorand, Unther fell far under the rule of the cruel manifestation of the deity Gilgeam. With Gilgeam's death at the claws of Tiamat, Unther was plunged into chaos. Slaves rebelled, commoners rejoiced at the death of the tyrant, and clerics of Gilgeam and nobles struggled to maintain order. The armies of Mulhorand took advantage of this unrest, invading southern Unther and placing conquered areas under martial law. Now Unther is a country divided between those who cling to the old ways and those who hope the pharaoh of Mulhorand will treat them better than their old ruler did. Unther is a land of opportunity, where military force, diplomacy, subterfuge, and intrigue all play a part in survival and power. Victims of a cruel tyrant, the people of Unther had grown used to - but not complacent in -hardship and misery. While the land's exalted nobles lived a life of luxury, served by slaves and supported by the national treasury, the common people paid high taxes, and slaves were treated so poorly that the punishment for killing one was paying a fine to the owner. While the government espoused the power of law in Unther, those who enforced the laws often disregarded the rights of citizens in favor of acquiring wealth and power for themselves. Slaves worked long hours for little food and were branded on the arm as a sign of their servitude. With the fall of Gilgeam, the lower classes glimpsed a hope that their lot would improve, but the arrival of the Mulhorandi army has confused the issue. The army is controlled by the clerics of Anhur, a warlike yet good-aligned deity - and a radical change for the people of Unther. Abuses against the conquered people are rare and rapidly punished. Untherite slaves (whether owned by temples or individuals) became property of the churches of Mulhorand, a better lot in life than they had ever known before. The fit slaves were given rudimentary arms training and sent to root out hidden pockets of Untherite resistance, a vengeful task they performed well. Now the few free cities of Unther look to their brethren in the south and wonder if they are better served being patriots of their homeland or citizens of the new empire. Because the armies control the fertile fields in Unther and food shortages grow imminent in the free cities, leaders in the north are pressured to acquire food or surrender. The army of Unther is ill-trained and poorly equipped with bronze swords and bronze half-plate armor. The personal retinues of the surviving nobles and temples are better armed and much more formidable in the field. The River of Swords was long recognized as the border between Unther and Mulhorand, but it is no longer clear exactly what the new border will be after Mulhorand's armies cease advancing. Black Ash Plain: This area, south of the Smoking Mountains, earns its name from the gray soot blown from the volcanic cones of that range. It is inhabited by brown dragons and black-skinned stone giants, which are locally known as ash giants. This area is not particularly fertile (it has almost no soil other than the ash itself) and was avoided by the Mulhorandi army. The Green Lands: The soil of the Green Lands is enhanced by magic and is normally responsible for three-fourths of the food produced in Unther. The area is inhabited by androsphinxes and gynosphinxes, that occasionally raid cattle farms. The Green Lands were churned into mud by the army of Mulhorand, and imports of food from the east will be needed to prevent famine in Unther this year. Methmere: This lake is thick with fish, which are dined upon by the native plesiosaurs. Bandit settlements dot the western coast, and many refugees fled across the water when the Mulhorandi army arrived, some captured by bandits and sold into slavery, some reaching Chessenta on their own, and yet others struggling to survive on the shore. Methwood: This thick forest once sheltered a number of druids, but they left or died out over a hundred years ago. Now home to small tribes of elves and half-elves, the Methwood is also inhabited by chimeras and an old green dragon named Skuthosim. Legends of a lost city of the Turami race in the forest, possibly dating back to the time of the Imaskar Empire. Smoking Mountains: The western end of this range has active volcanoes, while the eastern end is dormant. Guyanothaz the red dragon lairs here but hasn't been seen in centuries. The mount are also home to pyrohydras and salamanders. The population numbers in occupied cities do not include roughly 20,000 soldiers of Mulhorand who are currently stationed in Unther. Messemprar (Metropolis, 99,776): Once the largest city in Unther when it was a major port on the naval trade route, Messemprar shrank when merchant vessels began to avoid Unther's coast and Gilgeam's excessive trade taxes. A brief civil war within the city broke out a few years ago after a tax revolt that led to a food riot. The riot ended when the wizards of a secretly anti-Gilgeam group called the Northern Wizards took control of the city. Now Messemprar has more than doubled in size as refugees from other cities in Unther flood into it. The Northern Wizards wished to be free of Gilgeam, but did not expect their freedom to be followed by the swords of Mulhorand. They have been working frantically to fortify their city against the army and pleading with pharaoh for a cessation of hostilities. The Northern Wizards have a standing agreement with several adventuring groups to smuggle food into the city. If anyone could be said to be the leader of unconquered Unther at the moment, it might be Isimud (NG male human Wiz15/Dev3 of Mystra), who is the foremost of the mages of Messemprar. His fellow mages are a fractious group whose power is not well respected by the turncoat nobles of their host city. Shussel (Small City, 9,110): Two years ago almost the entire population of this city vanished in a single night. The war against Mulhorand had nothing to do with the disappearance of the city's population - the accounts of survivors and numerous divinations reveal that a mysterious fog descended over the city and lingered all night long, carrying away nine out of ten of the city's citizens when the morning sun broke. Shussel-folk who were away from their home city reclaimed their empty town, now filled with entire districts of abandoned residences. Squatters and bandits followed, taking advantage of empty homes and left-behind wealth. Shussel was growing poorer anyway before the Vanishing; its iron mines are playing out, and over-farming of the fields to the north have left them little more than a desert. Now Shussel exists as a Mulhorandi garrison town, its small port under heavy guard so that ships from Skuld may dock here with supplies and fresh troops for the Mulhorandi invaders. Unthalass (Metropolis, 164,627): In its heyday, this city was grandest in Faerûn. Since then, it has been flooded many times, attacked by pirates, and nearly destroyed by a battle between Tiamat and Gilgeam during the Time of Troubles. Now the army of Mulhorand occupies the city, with about half of its former population under martial law (if free) or claimed by the church of Anhur (if slaves). The undercity is home to monsters such as lamias and wererats, with a great lamia ruling all as a queen. The monsters are biding their time since the occupation by Mulhorand, making occasional raids on the surface as they did when the city was free. A secret temple to Tiamat also lies beneath the city. The central district, formerly inhabited by Gilgeam and his clerics, was ransacked after the deity's death. Unther's history is strongly tied to its sister Mulhorand's, except that the people of Unther have always had a more aggressive and expansionist bent than those of their eastern neighbor. 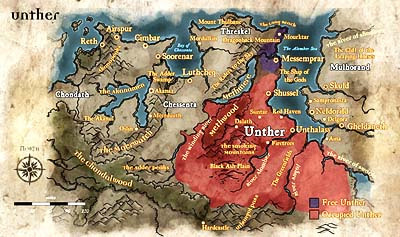 Unther's territory once included what is now Chessenta, Chondath, and cities on the southern coast of Aglarond, and its fierce and ruthless warriors were hated by those they conquered. However, the cost of this expansion bankrupted Unther's treasury, forcing the rulers to raise taxes to absurd levels. Piece by piece, the colonies of Unther rebelled. Chessenta succeeded in conquering Unther and ruled it as a vassal state for nearly a hundred years. With the disappearance of the Chessentan hero-conqueror Tchazzar, Unther was able to free itself and turn its focus inward on its own cruel people. The country that had made great advances in sculpture, poetry, and other civilized arts became engaged in a slow decline in morale and culture, as if following Gilgeam's descent into tyranny and madness. 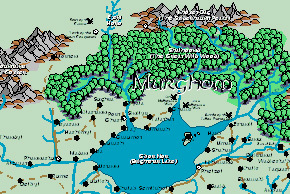 When Gilgeam was slain by Tiamat, Mulhorand saw an opportunity to attack and crossed the traditional border between their nations, conquering first small towns and outposts and finally the Untherite capital and cities beyond. Left with less than a third of the territory it held a year ago, Unther is on the brink of ceasing to exist. Only the mercy of Mulhorand's pharaoh or powerful intervention by outside agents (such as the Red Wizards, the Zhentarim, or the church of Tiamat) is likely to save Unther from becoming a territory of the new empire of Mulhorand. The Red Wizards in particular are loath to see that happen, and are supplying both money and power to help Unther remain independent. Cautious Untherites are wary of the eventual cost of this aid, but many feel that any alternative is better, than becoming subject to Mulhorand's rule. A Man without a God: The murderous right hand of the dead god Gilgeam, the high lord Shuruppak (NE male human Ftr20/Rog3/Wiz7) was once the Chosen of Gilgeam and an agent of his lord's displeasure, usually sent to kill political or dangerous opponents. With the death of his deity, Shuruppak lost his Chosen status and went rogue, killing anyone who crosses him or he perceives as an enemy to Unther. Shuruppak's long-term goals are unknown, but the church of Tiamat would like to acquire his services. He wears black robes and a red skull-mask that covers the top half of his face. This madman has been a figure of terror for so long that he truly considers himself the Reaper, a name he acquired in the service to Gilgeam. Secret Patriot: The bandit leader Furifax (LE male moon half-elf Ftr15) is a worshiper of Tempus and former palace slave. He uses his agents to smuggle contraband and watch the army leaders, for while he wished his country to be free of Gilgeam, he didn't want it under the thumb of anyone else. He is allied with the church of Tiamat but realizes that it plans to take control once the Mulhorandi have been driven out. Once part of the great empire, this country is semi-independent from Mulhorand, giving food to its parent in times of famine and cavalry in times of war. It consists of semi-autonomous farming villages each ruled by an elder known as an ataman. The atamans gather into a collective government only in times of war. The people of Murghôm are known for their skill with horses and their battles against their historic rivals in Semphar as well as the undead and monsters that infest the northern shore of Brightstar Lake. This remote country to the east of Murghôm is another possession of Mulhorand. Although Mulhorand claims it as its easternmost province, Semphar is completely sovereign. It has grown wealthy from trade between western Faerûn and Kara-Tur, and even has a college of magic. Semphar is otherwise very much like Murghôm.